How Does Ferulic Acid Help the Skin? Which Ferulic Acid Serum Works Best? Ferulic acid, a naturally-occurring compound in plants, is a powerful antioxidant that’s gaining popularity among dermatologists. 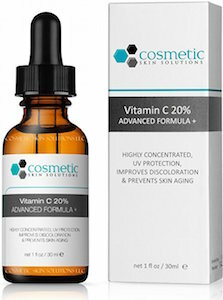 Serums containing ferulic acid combined with vitamins C and E can help prevent skin aging and skin cancer. Most ferulic acid skin serums aren’t cheap, but given the benefits, many skin care experts believe that they are worth it. Ferulic acid, an organic compound also known as a hydroxycinnamic acid, gets its name from Ferula, a genus of plants in the carrot family. As a powerful antioxidant, ferulic acid can help prevent skin damage and is gaining a reputation as an anti-aging agent, prompting dermatologists to use it in skincare products. To understand how ferulic acid can be useful in skin care, it’s important to first to gain a better understanding of skin damage and aging. Skin aging falls under two categories: intrinsic aging and extrinsic aging. Intrinsic aging refers to the natural processes and factors that lead to skin aging regardless of any environmental influence. This includes the individual’s genetics, their cellular metabolism, hormone levels and metabolic processes. Over time, the skin loses its elasticity and moisture which leads to the appearance of fine lines, thinning of the skin’s epidermis (outer layer of skin) and sagging. This is primarily due to the gradual — about 1% per year — breakdown of the protein collagen. Collagen serves to create a supportive tissue that binds cells together, giving the skin its natural taut and elasticity. Extrinsic aging refers to external environmental factors that can prematurely age skin and affects the skin differently than intrinsically aged skin. In extrinsically aged skin, the epidermis becomes thicker while the dermis (inner layer of skin) becomes thinner. The skin develops coarse wrinkles, discolorations, and even skin growths. The most commonly known and documented cause of extrinsic skin aging is sunlight damage (photoaging), with overexposure to ultraviolet (UV) light being the primary cause of photoaging. Other causes of extrinsic aging include smoking, poor diet, stress, lack of adequate sleep, and air pollution. Even exposure to excess heat, for example in activities like Bikram yoga, can cause premature aging and lead to blemishes normally associated with sun damage. UV damage can lead to the creation of free radicals, which can cause damage to the DNA in cells, and lead to cancer development. Free radical damage is also one of the major causes of prematurely aged skin. In addition to damage at the cellular level, free radicals damage collagen and prevent its regrowth. Similarly, they reduce the amount of elastin, which is another protein that maintains skin tautness. Antioxidants, like ferulic acid, are compounds that combat free radicals, thereby helping to keep the skin looking healthy and young. Ferulic acid is commonly combined with two other antioxidants, vitamin C (L-ascorbic acid) and vitamin E, in a serum (a CE ferulic serum). A vitamin C-vitamin E combination provides protection from sun damage and combining them with ferulic acid gives an even stronger degree of protection. In fact, there’s an eight-fold increase in photoprotection when ferulic acid is added to vitamins C and E because the combination of the three stabilizes the compound. This serum makes an excellent addition to sunscreen, as recommended by the National Institute of Health. A CE ferulic serum can help the skin look younger in a few ways. First, due to its antioxidant properties, ferulic acid can help prevent fine lines and wrinkles due to photodamage. Furthermore, Vitamin C is crucial to the development of collagen, and applying vitamin C serum topically can help regenerate collagen in skin of any age. High levels of collagen keep your skin looking healthy and young. The serum can also serve as a brightening agent since both vitamin C and ferulic acid inhibit melanin production, thereby decreasing sunspots and blemishes. “Vitamin C in these serums acts to inhibit pigmentation and overall lightens skin with regular use,” says Dr. Weichert. Most of these serums aren’t cheap, but given the benefits, they may be well worth it. It all depends how much you value your skin, or how concerned you are about skin cancer. Dr. Ward suggests two things to look for when considering a product. First, look for high percentages of active ingredients. Second, buy from a physician or reputable source in order to ensure that products are legitimate and haven’t expired or lost their effectiveness. 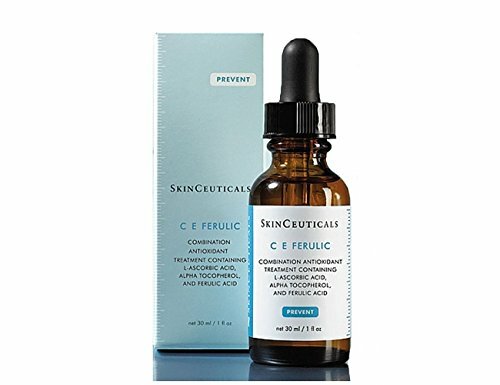 “I love CE Ferulic from SkinCeuticals,” Dr. Trent concurs. In addition to SkinCeuticals’ serum, Dr. Ward suggests FormRX Complete Vitamin C Serum with Ferulic Acid. It has unique ingredients that help to penetrate skin for maximum protection, and FormRX claims their product reduces sunburned cells by 96%. In addition to fighting free radicals and preventing sun damage, this serum contains hyaluronic acid, which helps keep skin moist. It helps out to even skin discolorations and boost collagen growth, giving skin a healthy, young glow. This one is an all-rounder: it brightens skin, prevents sun damage, helps with collagen formation, and neutralizes free radicals. Its formula also helps to penetrate skin and smooth fine lines. Guaranteed fresh for three months, this serum promises to reduce wrinkles and exfoliate while slowing the oxidation process, helping skin look as healthy as possible.